Having moved the brewery a couple of times I found myself wondering how I could uncouple the wagons from the train and even more important how I could collect them again without arms that were 10 feet long! Some sort of automatic coupling would be in order. Also I have another black spot in the terminus station where a Loco cannot be uncoupled easily to run round its train. So I looked up Kaydee couplings and contacted Invertrain for advice. Chris sold me a set of 745s a magnet and a height gauge and I duly started with one loco and a couple of vans. My initial purchase. A good starter selection. There are 2 pairs in each carton enough to do 2 wagons if they are to have couplings on each end. The height gauge built, a very useful item and something you cannot do without. It not only gives you correct coupling height but, has two track gauges and an arm height gauge as well. A piece of test track on a plinth, with the magnet inserted between the rails, (sleepers removed). You can see how large it is. The magnet is ceramic and comes with a metal intensifier. A couple of vans in the trial. They each have a single piece of lead to add weight. They were not heavy enough to connect up easily so if the wagon or van is light it will have problems bouncing off the couplings. So I increased the lead 3 fold. Choosing a loco from my stock was a problem. My Tower models Pannier had big stretchers in the front and rear chassis making it impossible to fit them on that loco. A Springside Prairie has front and rear bogies that get in the way and the front bogie binds on the gear box lifting the bogie wheels on curves. So I turned to an old Barry Dock shunter as shown here it has plenty of room to fit the coupler. Also on the starting blocks is a JLTRT 0-6-2 tank which has plenty of room for the couplings. Others will follow. I am waiting for the replacement magnets to see what improvements need to be made, if any before fitting them to the Brewery yard track. The magnets - 'bar magnets', I received look like being the incorrect type to use. I took advice from a Gazette article but it seems the info in the article was incorrect so I'm back with the Kaydee magnet system for now. The article suggested that one side adjacent to the track be south and the other side be north but its the top face that needs to be the same polarity to make the couplings part. The coupling arms are of soft metal and magnetise when over the bar magnet, this has the effect of repelling each other which is what the system requires. 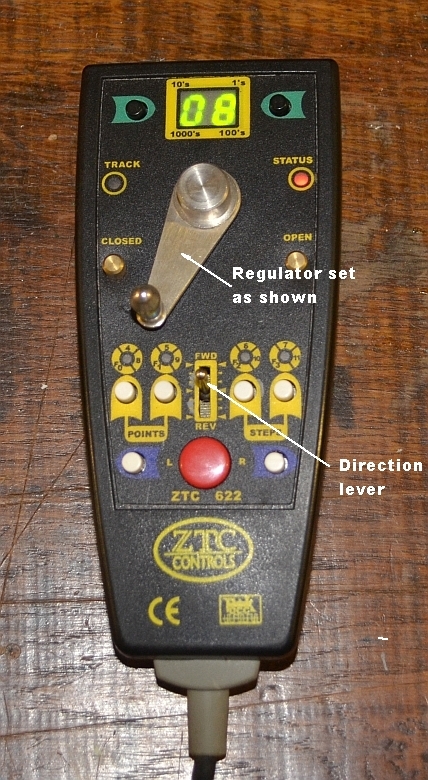 Controlling the uncoupling/coupling process was achieved by using my ZTC hand held controller. The regulator was just open to provide slow movement and the 'direction lever' was then used to drive the loco and go back and forth over the magnet to uncouple the train and then push the van up the track. Using the Centre off setting I could stop the loco quickly to aid the coupling/uncoupling process. Here is a video of them at work on my railway. One thing to watch out for is the track levelness. If it is uneven as mine can be in certain places the couplings can spring apart. As shown here in the diagram, (click for a larger image). A consist of GW coal wagons 3 link coupled together with Kaydees at each end. A consist of GW vans, 3 link coupled together with Kaydees at each end. A consist of GW cattle wagons 3 link coupled together with Kaydees at each end. A consist of mixed traffic wagons and vans 3 link coupled together with Kaydees at each end. Two GW toads with Kaydees on one end. Brewery wagons Kaydees on both ends. A consist of PO Milk wagons Kaydees on both ends. The current thinking is with smaller locos and shunting activity. Passenger mainline activity will follow. Not all rolling stock and locos can easily be converted. Slaters plastic wagons are a snip, but brass wagons are not so straightforward. PECO wagons have a different buffer spring system and this needs to be altered when fitting Kadee couplings. I have yet to do that! So far, I have fitted 746s between coaches as they have longer reaches in an experiment to see if they can stop buffer binding. If this proves successful I will convert others. You can see a small gap between the buffers.